Google is developing a new feature for Voice Search that will allow you to ask a question in one of multiple languages – without manually reconfiguring your ‘mother tongue’ each time. At the moment, the company translates Voice Search queries based on the default language you have set for other Google services. To change this on the desktop version, you have to press the Settings icon, followed by the Languages option in the search results page, before making a new selection. It works, but it’s not exactly quick or intuitive. 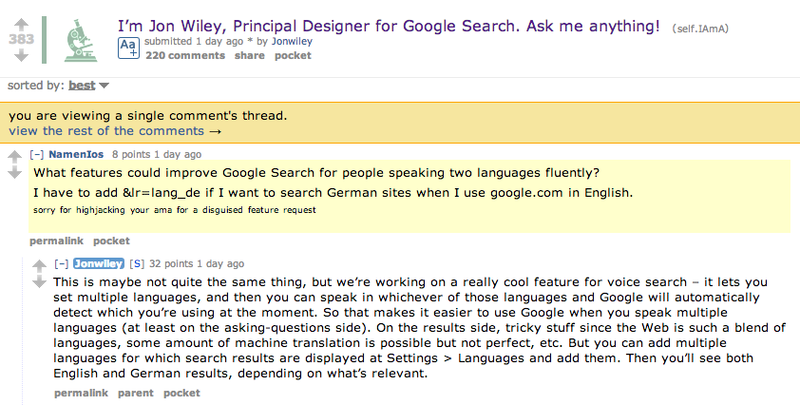 Jon Wiley, Principal Designer for Google Search, said in a Reddit AMA (Ask Me Anything) that the company is working on a new feature that will allow you to set multiple languages simultaneously. So if you speak both French and English, you can alternate on the fly and Google will adjust automatically. Wiley didn’t give a timeframe for the Voice Search tweak, but if Google is actively working on the feature, it probably isn’t too far away.